Sorry if this has come up in the past. I didn't find an older thread that addresses this specific issue. One of the most important things in a well functioning EM are new, good quality rubber rings. I was wondering what people here use and if any are better that the others? I've been pretty dissatisfied with the quality put out by Wico lately and didn't know if there was a better source. Wico? When did they go back in business? If you want good rubbers, order them from Pinball Resource. The WICO rubber rings are from PBR. They're not bad, but they seem to wear out pretty quickly; at least the ones I've gotten over the past year or so have. I get most of my pinballs from titanpinball (the ones from marco/PBR have come tarnished in the past and I like my pinballs to be new and smooth). I wasn't sure where they were sourcing their rubber rings from and was worried I'd have some play issues since they are more focused on SS games. Maybe I'll give them a try. How has your experience been with PBL? I've always had the best customer service from PBR with Marco not far behind them (though they also are more SS based and I've had some issues with some parts they've sent). I do like that Marco includes the chart with the rings. How has your experience been with PBL? I have a friend who buys in bulk from PBL and he loves them. I used the rubber rings I got off of him (I was out) and they are nice and snappy. I had to source the 5" rubber rings from PBR. I have not ordered anything from PBL but I have heard nothing but good things about them. I ordered a set for my Strato-Flite from those guys in Michigan, (I'm being nice), both kicker rubbers snapped after 2 months. Replaced with Marco, have not had a problem since. To explain why I ordered from those guys in Michigan, ebay gave me a $20 credit to use on anything, so I bought a rubber kit. Recently purchased a bulk supply from PBR based on an inventory of my games & rubbers used-they are a great quality. When doing a resto I have on hand a game extract from the GTB parts catalogue to ensure the specified rubbers are used. Just bought a rubber set for my 1968 Royal guard. Will be a while before I can install, but one issue I see w/o opening up the baggie is that the "T" rubbers are an odd light grey color, NOT cream white like the rings are. 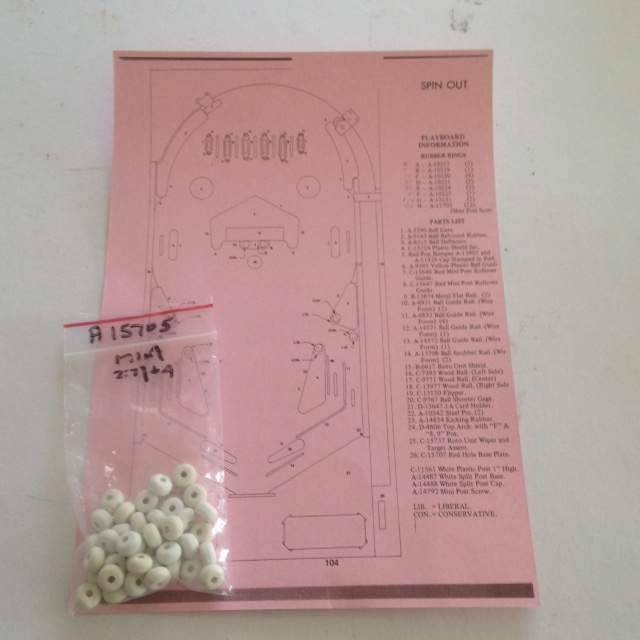 I like to order kits from Action Pinball & Amusement. Good quality and they send a chart that shows where everything goes. Great reference in case one breaks. First off, rubber today is WAY different than rubber from the past. rubber is way too soft. It has no longevity, and comes apart quickly. I've discussed this with Terry at PL. He doesn't want to change things. improvement over the stuff everyone else is selling. pretty decent. Hence SR's usage of it today is really not a huge factor. Switched to vintage white rubber, and game times are about 3 minutes. end, that just means they play more games! rubber is not the "default" rubber that he sells." Clay seems to be somewhat of an expert on rubbers. How does he feel about the ribbed ones? I've been very happy with Marco's rubbers lately. Thank you very much! Completely changed over to silicone rubber rings. Bright white, easy to clean. Me too. Buy mine from Pinball Centre Europe and am totally stoked. In his post he said you had to specifically ask for the new stuff. Is this now the "default"? I recently bought white rubbers from Marco. Each set of rubbers had its issues, either missing sizes or not enough or too many of each size. Doesn't seem to be any personal responsibility over there in regards to rubber kits. n his post he said you had to specifically ask for the new stuff. Is this now the "default"? Must be. I don't order kits. Just the sizes I need or am getting low on. Consistently top quality. I find it interesting that supposedly the "new" rubber will not stand up to heavy play. I've got the new stuff on all my games, they get quite a bit of play, well more than 100 or 200 plays a year, and none of them have fallen apart or broken or anything along those lines. Some of them have been on there five years and other than cleaning them up, I've done nothing. They're still solid and bouncy and look and work great. Maybe I've just been lucky. I obviously don't play mine like games would be played on location but they're getting regular use and they've been fine. Almost all of it has come from PBR. I have had brand new rubber break in a few weeks. when the rubber is stretched and prematurely breaks. I have had no problem with PBR rings or kits whatsoever so far and is the only place I buy them. I have had some on machines for over 3 years and no issues so far, still plenty bouncy and no cracks. It depends where you get your new rubber from. I've got some coming from PBR and I will compare them to Marcos and see if they are both the same now. Ones I got from PBR before were good. The ones that say PL on them I've thrown away. They're all from PBR, all the way back to when I got back into the hobby in 2010. Never had one break. I wouldn't be surprised if PBR and Marco are using the same ones now. I only found out about the high qulity Marco has now as they are one of the best sources for some of the newer games I've gone thru, and got some when I ordered from them. Then I bought a bunch. The ones I got from PBR a few years ago were very good too but had some color variations and some seemed old stock. But they worked. Titan. The flipper rubber in particular will give your game a little extra zip. The rubbers I got from PBR with my recent order are marked Wico. I have now compared them and although they are still the best source for almost everything else, I'm going with Marco's PRW brand.